shipyard agents are welcome ! 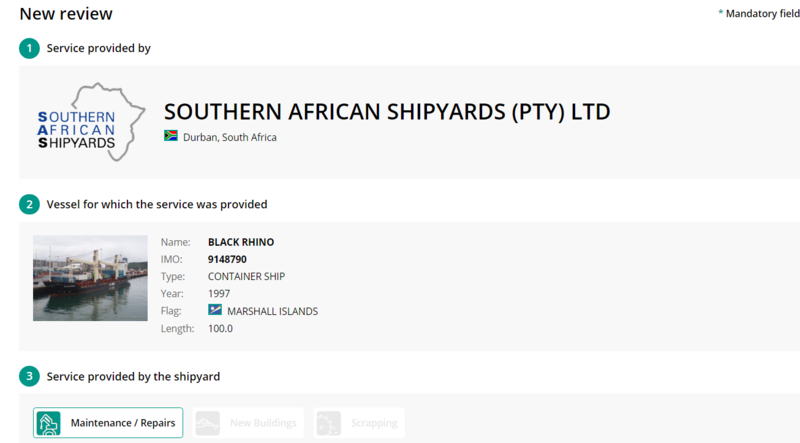 As a first step, we have developed a directory of shipyard agents, where agents can list their business and also mark the shipyards they represent. As a second step, we want to work together with a limited number of agents, so that our users can be guided and get help from agents if they want and need this help. Costs and commissions are shown and listed in a transparent way. So, if you are a shipyard agent and you see the opportunities for your business to grow, please contact me via linkedin profile or via our contact page. I would be happy to get in contact with you and discuss the posibilities that trusteddocks.com can offer to you. Deviation Costs – distance matters when selecting a shipyard ! When shipmanagers are in the process of evaluating a shipyard, one of the important factors is the distance the vessel has to sail before it reaches the shipyard. If the distance of the last port of discharge or the next port of loading is short, it is much better for the pockets of the owner than if the vessel has to do a long journey without cargo and income before reaching the docks of the repair yard. Calculating the distance and the costs of deviation is now simpler than ever, because trusteddocks.com has developed the world first cost of deviation calculator for shipyards. 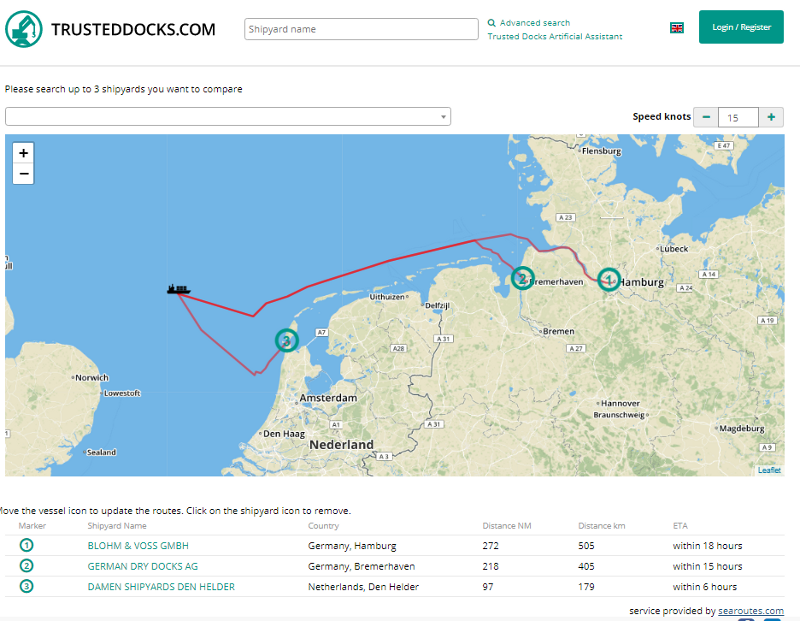 With this tool you can check difference between 3 selected shipyards when not logged in, if you are registered trusteddocks.com user, you can check distance for up to 10 shipyards. This service was created with searoutes.com and the usage of the searoutes.com api, and perfectly shows how this two projects are working together. 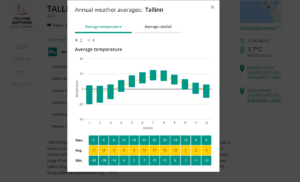 Please use the tool and give us some feedback, for further improvements. You also can contact us if you have similiar ideas or need help for searoutes.com or trusteddocks.com integration. Norway, Congo, France, Belgium, Panama and Turkey have also signed the convention. “Obsolete ships typically contain dangerous waste and they must be scrapped under adequate conditions,” said he food and environment minister, Esben Lunde Larsen. Larsen said that Denmark’s signature sets an example to other nations that it’s important to prioritise the sustainable scrapping of ships. Before coming into effect the resolution needs to be signed by 15 countries. At the moment the strong lobby of shipowners and financial institution is holding back other goverments to join this initiative, however things are changing and we hope that more countries will join in the coming years. Write reviews for your shipyards and tell us your experience! Restaurants, hotels, plumbers, doctors – everything is listed and rated on online portals like tripadvisor, yelp or Angies List – but shipyards are not ! We are not sure what the reason is, but it seems, that especially the big shipyards are scared to ask their customers for their opinions and to publish them afterwards. Shipyards agents also dont really care – we wonder why. 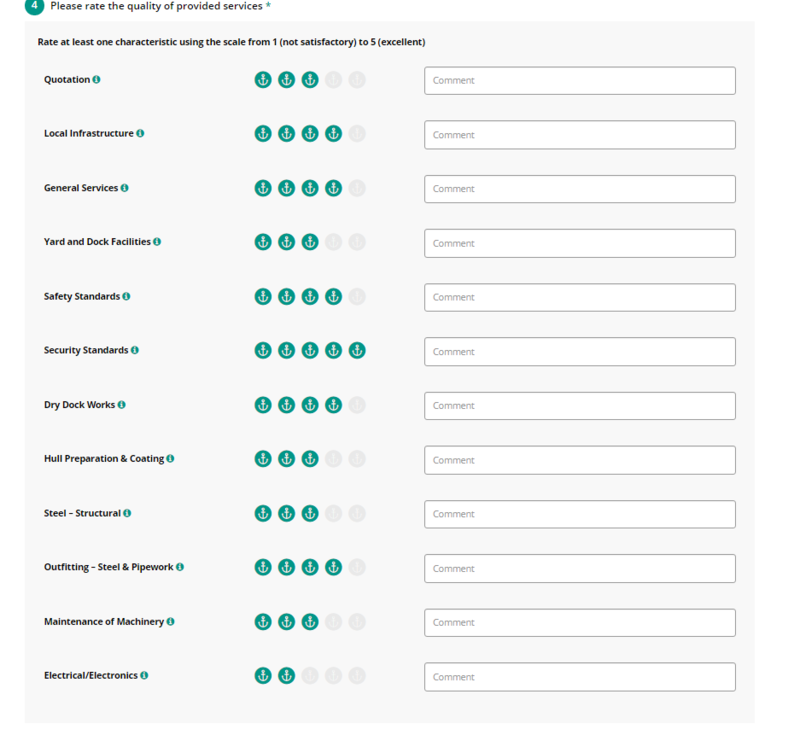 Today we have launched a review system, so that shipyards can rated and reviewed. But also shipyards can invite shipmanagers & owners to get ratings to evaluate their quality to become better and better over time. This is a serious part for us – we don’t want that one bad reviews destroy the reputation of a company. Therefore the reviews are first shared between the shipmanager & the shipyards when they are bad. After escalation / deescalation the shipmanager can decide to change his mind or to keep the review private or to publish it to everyone. If you are a shipyard manager, and you want that your repair or maintenance work is validated by your clients, please get in contact with us, so that we can provide you the rating tool free of charge. We are also happy to explain it to you and make it work. If you are a shipmanager or shipowner, and you want to give quality ratings to shipyards, please also get in touch with you us, so that we can give you the necessary tools for your work. Of course we are also happy to receive your feedback and we are also looking forward to discuss with your needs and demands. 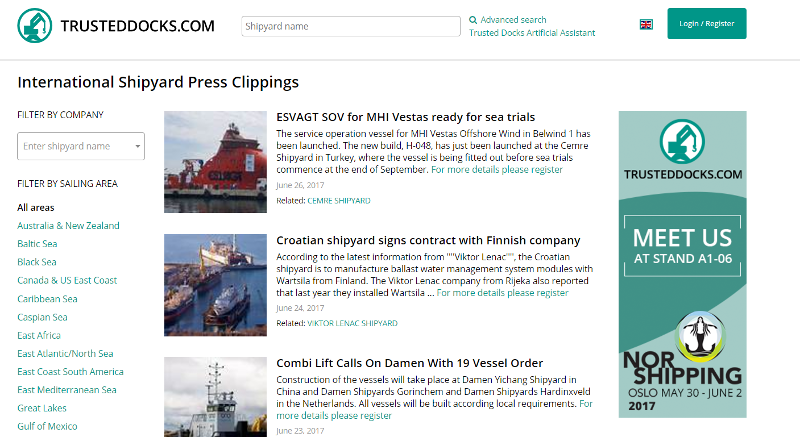 trusteddocks.com crawls millions of news website every day, to find news about shipyards, drydocks, shipowners and the newest trends in shipbuilding & shiprepair. Please share this link and make use of it – it is the easiest way to get and overview about our industry. 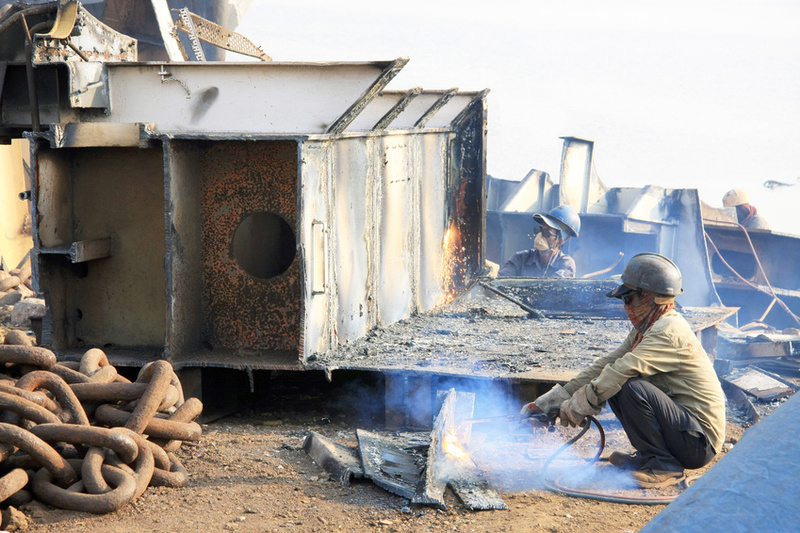 When it comes to shipbreaking its all about money. Ethics, sustainability human lives ? – who cares in this industry ? The German Television yesterday showed a documentary about the evil practices of German Shipowners when it comes to ship breaking. trusteddocks.com wants to supports those shipbreakers who act according to standards and take care for human rights, sustainability and environment protection. Although – she is very young – she has already 5 years experience in the shipyard market. She as analyzed thousands of dockings & shipyard visits and she knows exactly which ships has chosen which shipyard in the past. From this knowledge base, TaDa can give recommendations which type of ships, at what age should use which shipyards in a specified sailing area. Please contact us, when you want TaDa to work for you – she works free of charge and is always available. 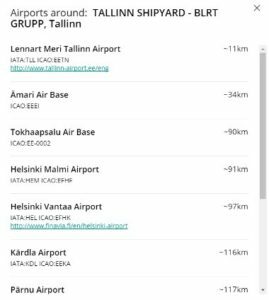 why are there hotels and airports on trusteddocks ? Welcome to the hotel of California was one of the biggest hits in the 70s. But, the Eagles were not superintendents and i am also not sure what they had in mind when they wrote this famous song. Anyhow, hotels and airports surrounding a shipyard are important for those people who go there to do their work. And it is always nice to have a clean bed and maybe a cold beer after work, than to be in a dirty place in the middle of nowhere. So check out the surroundings before you end up in the wrong place ! what do fleet superintendents and Crowded House have in common ?! “Weather with You” was one of the greatest Hits from Crowded House in the 90s. But not only the Australian Rockstars are surrounded by the weather – vessels in shipyards have the same issue. Thats why fleet superintendent should care about weather conditions and climate zones – because there are situations where some special work can´t be done. There are also extreme conditions where shipyard cannot be reached or left. Paint work, especially in tanks, can´t be done if the humidity is higher than 50-60%. But also hull paintings need dry and not so cold or hot enviroment to achieve good results. We also know about ships that couldn´t leave their shipyards because of heavy ice during the winter season in the Baltic sea. 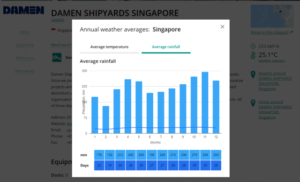 Because of this, trusteddocks has integrated weather statistics for all listed shipyards, so our users can have a look into the weahter statistics and forecasts before they decide which shipyard to use. And, of course – having a cold beer in the sun, after a hard day of work, is never wrong.